Our in house store also includes Boys Trendy Jeans. These are manufactured using quality fabric and are log lasting and trendy. The offered range of jeans is precisely designed and fabricated the supervision of our talented designer. 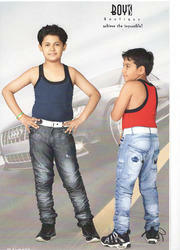 These jeans are perfect to be worn by fashion conscious youth, thus, highly demanded in the market. 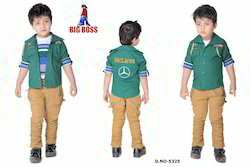 Offered by us is a fabulous range of Boys Stylish Jeans that provides excellent comfort to the wearer. These Boy Wear are sourced from the leading vendors of the industry, who make use of finest quality fabric in tailoring the array. Besides, our efficient tailors offer excellent options on these boy wear in terms of their sizes and colors, suitable to the clients. Looking for Boys Jeans ?